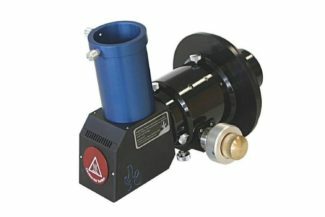 If you’s like to add some extra height to your Skywatcher EQ6 mount, this Pier, or Tripod Extension will do the trick. The metal extension raises the EQ6 an additional 8″, allowing you more room to view through the eyepiece of long telescopes, such as refractors. The EQ6 Pier Extension is painted white to match the EQ6 mount, and is mounted between the tripod or pier and the mount itself.